My thoughts have experienced a bit of a bottle-neck in regards to all that’s in the cultural air. I have lost count on the number of hot-button issues to comment on or avoid — maybe you can relate. When I first began this blog, I thought it would be an exercise on finding the nuance that was often missing in our current cultural conversations and hoped to approach this informed by a Christian faith perspective. I hoped I could contribute to the conversation by saying your nuance is needed, and the nuances of the other is also needed and that we needed to make space for one another. Avoiding talking about particular issues hasn’t seemed to lessen the cultural tension in my corners. Further, voices that call you to take a side have been further amplified and even rewarded in some ways – but unpacking that observation may be for another day. Til then, it sure seems that if I call someone the devil, I lose 50 friends but gain 100 new ones – that’s disturbing. So I’m left often wondering, what would it look like to live in a society where a chief value was to listen to the voice of the other and to truly work to understand the other person’s perspective? What I mean is the chief value would be to seek to understand the other as opposed to being right. Currently, understanding the other feels very secondary, and very optional. Being right, or more right than your ideological opponent seem like the supreme values. And that thinking, puts “the other” in a secondary place. Wouldn’t you and I love to live in a place where “the other” sought to hear you and truly understand you first? Well, “the other” would love that from you and I as well. Now, we can all certainly appreciate that not all opinions are created equal, that not all opinions have been informed by the same quality of thought and have been shaped by various pieces of data, personal experiences, values and points of logic and on and on. But what if we could seek to understand the other first? And even if the same conclusion wasn’t reached, even if the arguments kept their opposing perspectives, we would not only gain mutual respect and understanding for each other, but I suspect the conversations would also grow. And not just the conversations but those us of having the conversations would also grow. Hopefully, they would grow beyond the rhetoric and into better community. And that community would have diversity of thought, ethnicity, and more. The nuance for me isn’t going to be found in discovering the “most-right” rhetoric and articulation of a complicated matter – That feels like a unicorn chase. It will never be right enough. But what if we did two things here? First, what if we created our opinions, convictions, and ideologies in ways that best we can – with intellectual integrity, a robust moral compass, with prayer (for those that hold that practice essential) and with faithfulness to a common-good belief system? And second, what if we would truly to seek to understand the beliefs of those around us who are doing their best to find their way in this complicated, painful world that hopes for healing, justice, redemption, and love? We don’t listen merely to see where you think they got it wrong, but to listen to the heart of why they hold this belief or position. And what if they did that for you? That would be the first step, that God-willing, would eventually lead us down a long, likely winding road that eventually lead us all to more thoughtful, a more informed, and more fruitful positions, and a more redemptive way forward for us all. That’s type of nuance way of thinking that I crave. Name the conversation, name the argument, name the cultural debate, name the outrage, and then ask yourself, what role does mercy play in it? All summer, I’ve been following the migrant parent-children separation. Despite the upheaval, judge’s orders, the reunifications are still ongoing and as the end of July about 700 children have still not been reunited with their parents. Then there are the stories of neglect and heartbreak of many children who cannot be reunited because their parents have already been deported. A podcast I recently listened to told the story of two siblings under the age of 10 who were to be reunited with their mother. However, upon arriving to that holding facility, they discovered their mother had already been deported and are now separated. All of this is just unimaginable to me. Between looking at the current headlines and conversing with concerned people, I keep thinking about how we got here. The first post acknowledged the tensions concerning the such debates and attempted to give a few takeaways for Christ-followers (you may want to go back and read later). And the biggest takeaway has been reflecting on the role of mercy as it pertains to the migrant child-separation debate, as well as many of our other cultural concerns, as well as many of our personal ones. Talking about mercy gets tricky because if you are not careful, you can come across judgmental towards those you believe lack mercy. But one can also come across as merely virtue-signaling in their demonstrations or calls for showing mercy. I think most of us have been troubled by the experience when mercy was not shown by the person or community that talked so passionately about it. And dare I say, some have probably been disappointed with us for our lack of mercy showing. This likely includes you, my dear reader, as well. In a society where the benefit of the doubt is harder to find, we all need to be careful of how we talk about mercy and this seems to be a fair point to acknowledge. So let’s begin by saying we all have our blindspots of mercy. What are these blindspots? Well it probably has to do with certain people demographics and people in specific situations and roles. … who are the people that tend to not receive our benefit of the doubt? … who are the people who tend to get our blame? … who are the people that get the credit and who are the opposite or the rival of them? The answers to these questions might help us uncover our biases, our prejudices, our assumed loyalties, and our blind spots of where we often lack mercy. In our more self-reflective moments, we might see that we are all inconsistent with our mercy. It’s ok to admit this. If you were perfectly merciful then you’d be God. (It’s ok that we’re not, it just wasn’t our calling to be divine). But for the sake of argument, I suggest that these blindspots, these inconsistencies, are very much a part of our humanity and that only God can be perfectly merciful. However, this broken reality does not excuse us from trying to be more consistent. In fact, that’s the thing – we need more consistency, and we can begin by uncovering our blinds spots. We need others to point them out and others might rely on us to point out theirs. It will only work if we pursue such an endeavor in love, and for those who identify as Jesus-followers, we need to be rooted in prayer, depending on God’s strength as we have been called to this and more. As we continue to endure this season that has stopped extending the benefit of the doubt to one another, may we reclaim the need to have and show mercy. And as we process our frustrations, our outrage, our longings for justice, may we also look deep within our hearts and confront our mercy blindspots. In removing the planks from our eyes, we will not only gain credibility with each other, but together we’ll see the needed steps ahead to forge through this complicated and ever-changing world. Each day feels as if there’s a new set of rhetoric that emerges that responds to yesterday’s arguments and many of our own thoughts feel instantly uninformed and somewhat antiquated. For the past few weeks we have been watching a series of events of children being separated from their parents as they were attempting to cross the US border. It’s been compounding on a number of levels. How do we deal with the illegal immigration problem that has become even more politically loaded and increasingly morally intricate? How does a nation protect its borders, how do we grant asylum to those truly in desperate need, how do we identify and confront actual evil-doers, who do we turn away and why and how do we do this with mercy and justice? These and many other questions fill our minds and airwaves. And so does all the rhetoric. Like with all complicated matters, it’s tempting to over-generalize. From “Lock them all up, we don’t need anyone else!” to “Open it up to everyone, we’ll find space!.” Most of us have heard a variation of these over the years. These sound-bytes may be cathartic for some, but to say it politely, don’t really give us a pathway for a solution for these arduous matters at hand. There’s the problem and then there’s how we talk about the problem. How many times has a conversation shifted to debate and then mutated into something ugly? We began as friends, turned into combatants and left unsure how our friend can be so wrong on this issue. Intentions are assumed, loyalties are questioned, ideologies are attacked and often convictions become trampled on. It’s no wonder the frustration is at breaking point. Per usual, the information comes in pieces. In this case of migration and child separation, we ask if these migrants are being caught crossing illegally, are they coming to border offices requesting asylum, from exactly where are they coming from and why are they fleeing, do these children actually belong to these parents? And even more questions arise. And per usual, the answers vary. But we don’t always acknowledge that. For some it limits the leveraging of the moment to the desired outcome. And this is a problem in American civl discourse. Over-generalization and rushing to our tribe’s set-conclusion is not only dividing us further, but also creating greater distance for needed solutions. From some of the reports given across the spectrum of news outlets we could acknowledge that some families were leaving violent towns in Guatemala and El Salvador and other places. We can also acknowledge the reports that some seem to be using the legitimacy of that reality and using that as a cover to pursue the same reason for entrance. They could also be in a similar dire situation, they could be an evil-doer, they could be something else. (If interested, see the Daily Podcast – June 19, 20 and 21 – https://www.stitcher.com/podcast/the-new-york-times/the-daily-10 ). We learned of more complications like the court system that is dedicated to hearing each person’s case is incredibly back-logged and the system is overwhelmed by other burdens that this post cannot adequately capture. Misdemeanors that were now felonies, deterrents that were no longer described as deterrents, zero-tolerance language, the verbal battles, the blame-shifting and loaded sound-bytes were all in the air and adding to the frustration and anger. And since we each have a biased filter, we heard it differently from one another. By the end of last week, the President signed an executive order saying the practice of separating children would be stopped. And while there was no given plan of reuniting these families, many of us are holding on to an optimism that our government will work fast here. And new information keeps trickling in. What have we learned? Well it depends on your governing ideology. As one whose first loyalty is to Jesus as my King, then I must say I was terribly grieved by all of this. I continue to believe that there must be a way for a sovereign nation to defend its borders with law, justice and also with mercy and charity. I continue to be careful of the allure of political power. It feels like a fair observation that some Christians, who may have felt like they were on the outside for a stretch of years, now enjoy feeling like they are on the inside. It also feels fair to say that some finally feel fairly represented. However we want to describe that is another story and I humbly suggest that it’s a secondary story in contrast to the essential story of how Jesus modeled the use of power and influence. My hope is that we may never sell-out the message and values of Christ’s Kingdom for any worldly, political gain. Where these values align, praise God, where they differ, may we pursue the Lord’s wisdom in not forsaking our true Lord for any substitute, less our actions be exposed as pursuing a form of idolatry. And lastly, I continue to hold on to Jesus’ words that we ought to be mercy showers. Mercy. If there was ever a virtue the people of Jesus should pick-up and champion in such a time, it’s mercy. And that’s where the next post picks up. If you write or blog, you know these gap moments. You have something to say, but by the time you get to it, the moment has passed. Then when you create the time and space to write, you hold back for one reason or another and never publish. Eventually you find yourself unsure of how to re-enter. From a thought perspective, there’s much to write about. My half-complete drafts and journal entries would tell you all about it. This last stretch included an amazing Easter, a fantastic Q Conference, a couple of lectures with N.T. Wright at Gordon College and I attended a Gender Equity Reconciliation event that has impacted me as well as a few other things. Further, I’m reflecting on all that’s relevant to me in the news as it relates to evangelicalism and post-evangelicalism, our societal and political climate, our race and gender divide, and how the message and Kingdom of Jesus informs all this for believers and how that message might be a blessing to the world at large. It can feel overwhelming really. On a more personal note, the past few months have covered a wide gamut for me and my family. It’s been a full and rich and challenging stretch with celebration, frustration and the ordinary-ness that life brings. Dissatisfaction interrupted by fulfillment and fulfillment interrupted by dissatisfaction seems to be the true thing to say. Inadequacy undergirded with confidence and vice-versa. Faith despite doubt and doubt despite faith. Truly feel this, and more, is all part of the microcosm of a life that aims to be self-aware, honest and hopeful before God. Our oldest turned 10 last month. And like we do, we went to a Yankees game to celebrate. Our second is loving second grade, being 8, reading Dogman, and playing baseball. Older daughter is dancing, settling in Kindergarten, and coming into her own. And the Baby is three and a half, full of personality, charm and mischief, and at that age when you just don’t know what they’ll say next. And my dear wife, Susan, walked for her Master’s in Education a few weeks ago. Just a summer class and student teaching to go and she will have completed her program and then pursue an ESL Teacher position. These really are the days. We’re so grateful for the big-picture of all of this. For the health, for the celebrations, the hugs and cute kisses and tender moments. But then there’s the everyday craziness. The hectic mornings, the fights, the ball in the house, the sewer line clogged and backing up into the basement, the missed email, ok, the missed emails ;), the check-engine light, the credit card bill, and all the follow-ups not followed up amongst other things. Despite that, I’ve been trying to find 30 minutes to write/journal at the end of the day. Some days are better than others of course, but when it’s all working, the practices of reading, writing, praying, dreaming and creating feel fulfilling and bring a sense of peace and clarity in the mess of it all. I continue to believe that things like joy and peace are experienced deeper when they are experienced on the other side of frustration and pain. Joy means more after suffering. I’ve long felt similar when it comes to faith and doubt. Faith means more having parsed it out against the tragedies and evil of the world. At the risk of creating a soap box, I think that’s a consistent theme in my preaching as I truly believe people would benefit from understanding this dynamic. And as it relates to this blog’s theme of looking for nuance and perspective in the mist of the complication and confusion, well … the past couple of months have only confirmed the need for this more. So at this point, I’m trying to get over the blogger’s block, commit to the writing the habit, moving drafts to published and a friend of mine is helping me with a TED style talk on nuance and gray areas. As always, thanks for reading and hope to connect more with you soon. Not in some clichéd way but in the true sense of God being with you – that God would help us all to unpack meaning and the goodness that is often found in our relationships, friendships and in community. The previous two posts, “Where is the Nuance Needed?” and “Nuance in the Inner Life” is to setup this one and the next, Nuance As We Engage Our World. Check them out if you haven’t already. In this post, we want to highlight that nuance is needed in our relationships and conversations and how we can include it while also retaining our heart-felt convictions. We all want to listen and also to be heard. This is the only way honest and authentic conversation works. I consider myself fortunate to have people in my life that share certain convictions as mine. At the same time, I consider myself fortunate that many of the very same people have quite different convictions as well. Though it can be challenging, and sometimes downright vexing, I’m better off given this reality. I hope many of them feel the same. 1. Accept that it’s an unrealistic expectation that your friend must begin the conversation in agreement on your points and terms or even with the framing of the argument as you understand it. The sooner we realize that we come from different starting points, the better we understand the conversation we are in. This is true for both our friends and loved ones and for the acquaintances and strangers we discuss such matters with online or in person. In my opinion this is why so often our conversations begin so poorly and this contributes to the problem facing our current discourse. The expectation to think, see and describe these matters precisely “as I do” is detrimental as it undermines our friend’s personal agency which erodes our mutual respect, and risks over-extending our pre-suppostions. Perhaps a helpful way to begin such a conversation is by simply asking, “How are you seeing this? What comes to your mind when you think of this? 2. Consider the possibility that your friend loves God and others and is as informed on this issue as much you are, maybe more. Consider the possibility that they are more righteous than you. It pains me to say this but some of my friends are smarter, wiser, kinder, and more Christlike than me. And maybe there’s one that’s funnier than me too but Jerry Seinfeld and I are not that close anymore so not sure that really counts. But why consider such things? For one it may actually be true! But second, it allows for you to operate out of a posture of humility. It may not be true, it’s very possible that your ideological opponent is less informed. And it’s possible that your friend is very informed and angry or hurting, the possibilities are endless. But you’ve lost nothing in extending the benefit of the doubt while creating an opportunity that leads you both to great gain. 3. Realize the objective of a conversation on a debatable subject is to look for the opportunity or for the nuance that will help to advance together towards a mutually better solution, practice or posture. The goal is not to be right or to justify one’s position or to conquer what one might believe is an inferior ideology. That’s actually another part of the problem. If one leaves the conversation battered, shamed, and offended, then most likely the gap has further widened and the relationship may have been strained. Of course, I am not referring to conversations that argue the best way to the airport or what a couple ought to watch on Netflix tonight or even particular family and professional points of tension that need working out. While nuance certainly has a role in such matters as well, it’s very likely that one has a better route to the airport and the debate on what to watch has its own unique inter-personal dynamic depending on whom you are speaking with. While nuance is helpful in such moments, this post is making the case for nuance in the “debatable” in terms of our social-political, philosophical, ideological, and theological conversations we’ve been engaged in for years. Such societal examples include the gun-violence epidemic that has seized our society, or the debates on sanctity of life in its various forms, our racial division on personal and systemic levels, or the factors of why Millennials and Generation Z’s are leaving the church and taking some X’ers and Boomers with them. The good of the conversation is advanced not when someone comes to agree with your point of view. That’s a small vision of “good.” The “good” is advanced when we truly take time to listen, understand and appreciate what the other is thinking, feeling, and wondering. And that’s where having an appreciation for nuance is of great benefit. It allows the listening parties to uncover something they may have missed or not truly appreciated as significant. Indeed, there is no blueprint for the perfect conversation, but may this sort of posture help us have better ones. We all crave deeper relationships and more meaningful dialogue without the pain and frustration that many of us are experiencing. And so may we be more intentional about nurturing such conversations so that we can exchange a deeper level of perspectives, uncover and appreciate the nuances and hopefully that will lead us not only to better discourse but also to closer and healthier relationships. This is the second part in a series called “Where is the Nuance Needed?” Click here for the first. Our lives are filled with complication, pain, and endless half-truths that demand us to figure out how do we reconcile it all. This series of posts aims to identify and unpack the various places where appreciating the nuances isn’t just helpful to survive but in fact, nuance is actually life-giving. And the first place where we can look is within. We need nuance in our inner life. In our mind, our heart, our prayers and hopes as we navigate our days that bombard us with a plethora of mixed messages as we try to make sense of this world and pursue a meaningful life. Despite how simple we want to make it, life is unruly and unfairly too complicated. The problems, the proposed solutions, the arguments, the passion, and our hope can overwhelm, disempower and frustrate us. Becoming more informed, reading, discussing, serving, and creating are helpful but none of these noble pursuits can bring us the arrival of conclusion and clarity we often search for. Our humanity has searched for solutions for ongoing personal and societal issues for thousands of years. Half our social media friends and personalities are screaming an answer, the books on our shelves and the new ones being promoted promise better answers and all our thinkers and communicators feel they have something to offer. God bless them all, but it’s a lot to process and many messages compete with one another. This is why pursuing “nuance in our inner life” is needed. When we offer such prayers, there is not a singular solution that we expect God to deliver to us. There is an outcome we might like to see, but there’s also an outcome or a set of outcomes that we trust God is ultimately sovereign over. Regardless of our type of theology, eventually I believe we must do our best to yield to God and when we open our hearts in prayer and worship, we receive from God too. Re-centering our hearts in prayer, in worship, in the wisdom of Scripture confronts the various agendas around us which includes our own, the agendas of those we admire, helps us resist the agendas of the powerful, and the much subtler ones. We might say something wonderful yet lofty like “No agenda but Christ’s!” But it would take a lot to figure out what this and isn’t. We would be wise to begin with the She’ma – loving God with all heart mind soul strength and love of neighbors (again Jesus points out the need for nurturing the inner life) but agenda, the vision of people around us, their message, their plan, our interoperation of them and the critiques and amendments that get thrown in, well, as mentioned, agendas are complicated. Speaking personally, this is where I have experienced much conviction between wanting a good thing and realizing that God might have actually something better. It may not be better for me however. In fact, it’s this confrontation of agenda where the truth emerges – I wanted this solved this way because it was good for me and … good enough for others. It’s not that our agendas are always wrong. They’re not. It’s that we risk deluding ourselves in thinking that we are always right. That our own thoughts and opinions are nearly infallible and that could lead to a very damaging and hindering sense of pride. Our agendas need confronting and our hearts need to be yielded to God’s will. Prayer, worship, fasting, reading Scripture and the many disciplines are essential practices here. Once personal agenda is confronted, new ways of understanding can be brought into focus. Focus is an over-used term but yet the moment of focus is such a beautiful experience. To see something clearer, to experience something fuller, to know something deeper. Or perhaps try this the next time you pray: Take an issue you are passionate about, then take an alternative position that you don’t really think would work. And in that prayer, ask God if this is something or someone He can use. This is both a liberating and miserable experience. God, can you use this proposed solution to help the poor? Is it possible the “other side” might have a solution that could work better than mine or my “tribe’s?” When it comes to political issues, this is in part why some of us do our best to avoid aligning ourselves with one political party or label over another. No party, no side, no label has a monopoly on the truth but more on that another time. The focus we receive from prayer isn’t typically that one solution becomes the silver bullet but rather something better. That God is sovereign, that God is able, that you will be ok whatever God does or does not do. Not because you and those you care about are immune to the pain, but because God is with you and God is with them. For the problems and pains of the world, we want more. I get it. We want the vaccinations for preventable and treatable diseases in third world contexts. We want adequate nutrition, clean water, shelter, safe passage, discrimination and harassment free contexts, we want education and basic needs and fundamental human rights for the marginalized. I desperately want this and much more too as we all want the suffering to end! But may we also be reminded that God’s presence can be with all those who suffer, even those whose poverty is not material or obvious and this reality, this gift, is an essential part of life as well. For me, this is a truth that emerges sharper and shaper the more I pray. God cares about this, God cares about them. And God loves them over there too. That’s easy to miss but prayer has a way of helping us see that clearer. If there is a word that has meant more and more to me over the years, it’s the idea of “fortitude” – that inner strength that not only protects the heart but allows us to persevere and continue on mission. Indeed the world is overwhelming. There are crisis that appear unsolvable and yet we feel inspired to serve the ones that suffer – this is noble but it’s also heartbreaking. To serve others, to pursue justice for another, to seek the common good without seeking the fortitude of God risks your own spiritual and mental health (among other things). Fortitude is what keeps in check our growing cynicism. Fortitude is what acts as both a wall to our hope and a generator of our action. It’s both a wall and a catalyst. We use this “inner strength” to both resist evil and to act justly. And we need nuance in our inner life to discern the differences, to recenter us, and to help us continue the long journey. Along the way, we may experience God’s deep wisdom that a prayerful heart draws from. There are moments of clarity that God gives and this consistent rhythm of prayer brings us closer to meaning, truth and beauty. Which in part, informs identify and empowers us for mission. Much more can and should be said and as we consider the nuances of life, let us also be reminded time and time again what happens when we pray with open hands and wide conclusions to a God who is more loving that we can realize and understands more than we can imagine. The next post takes aim at the need for nuance in our relationships, near and far, in person and with the avatars and profile pics we see. After that, we’re looking at nuances in our perspectives and in the issues facing our world. Appreciate you reading, feel free to interact in comments or private messages or of course, in more personal ways. Grace and peace, Tim. This blog project is on a “nuanced kind of Christianity” and aims to acknowledge the tensions found throughout life as well as the many postures, convictions, theories we might consider along the journey. We all have questions, we all want answers, and most of the answers don’t seem to satisfy enough. Consequently, most of the questions grow to become either annoying, boring, or painful. So we keep looking, form better questions, examine different paradigms, consider newer perspectives. At worst, we chase the wind, at best, we tangle with God’s wisdom. Maybe you and I are old friends and we’re on Facebook together or perhaps someone shared this post with you. Some of you know me as a pastor (would love to connect in person too), or your former youth pastor (I miss you! ), or just another blogger you found through Twitter (thanks for clicking, really). But whether you know me well or not, here’s what I want to make sure you do know: Like you, I am trying to make sense of this world and I don’t want to waste these days. In fact, I want to find enough of a handle on life so it can be enjoyed earnestly, to enjoy life the way it was intended: in community with family, friends, society and ultimately, with the One who created all things. In some ways, this is in part of how I imagine the Christian vision of heaven, and if there is the notion of heaven on earth, then how much actually be experienced now? Even further, how much can I contribute towards this idea of heaven on earth? I mean, imagine contributing to heaven – that’s a question worth pursuing and I think it will take some nuance to get there. Somewhere along the way of the degrees and the readings and the conferences and the conversations over coffee and beers, I started to really become convinced that it’s not going to be a new guiding set of principles to organize my life or a particular tribe of belonging or a specific sub-set of Christian philosophy that was going to provide the framework I was hoping that would give this handle to life. Most of us know we’ll never arrive, but do we over-value our philosophical vehicle or our lens of life? To me, this increasingly felt as part of the over-selling of finding the right knowledge and track and my own heart’s foolish desire for answers with the least amount of complication and pain. Though such resources and lens are not only helpful but necessary, life is too complicated, too tangled, and too charged with mystery to be explained too readily. The truth of God is too mighty for our feeble systems (and our finite minds). But yet, we must try as part of our humanity is to wonder, seek, be curious, doubt and believe for both, logical and arbitrary reasons. And we do this with intentionality and diligence. To complicate this further, there are competing perspectives of thought and they each contain some truth. Whether organized or personal, there is both a sense of objectivity and subjectivity and they are blurred when in conversation with a fellow human with all their strengths and frailties. This is true for the Christian who is just as committed to Scripture, logic and prayer, this is true for any adherent of any other religion or a set of philosophic ideologies they hold – we all have a some part of the truth. This does not make me a relativist. I’m not suggesting that all our views are equally truthful, nor am I suggesting that it doesn’t matter what view one holds. In fact, what you think, believe and practice really do matter. But all of our beliefs and convictions are broken to some degree, some more than others, and when we sit down with each other, it becomes possible to discover our shared truths, our shared hope, and thank God, sometimes we stumble upon beauty, though it’s incomplete. But let us consider, even incomplete beauty can be a gift to the soul. And so we need nuance – that sense of formulating, holding and sharing a belief with both strength and openness. Such nuance is needed in our inner life, in our relationships and in how we engage with our world. The next post will pick up with what nuance in our inner life looks like. Part 3 will focus on nuance in relationships and 4 will be on our engagement. Thanks for reading, friend. Reflections on Christ’s Peace – Part 2 – Is It Really Christ’s Peace If Your Enemy Doesn’t Experience Peace? Some of us have heard it so much that its wisdom has been lost by the cliche of it. 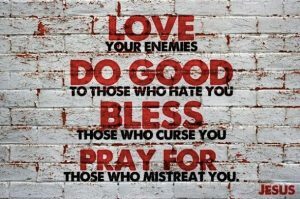 Jesus said to love your enemies and pray for those who persecute you (Matthew 5:44). There are days you might wish he didn’t say that. In one short verse, this whole teaching confronts all our tribal tendencies, destroys all our “us verses them” ways and pretty much drops a nuke on our selfish ways of life. It’s a powerful and confrontational teaching from one who is often called a pacifist. Now I”m not sure Jesus would have called himself a pacifist (Yep. And I’m not going to unpack that today either ;), but the teaching of loving all others, including our enemies was a critical piece of his teaching. It all boiled down to loving God and loving the other, with no exceptions. Again, if we can push past the cliche and let it sink in: Jesus is saying your enemy, your rival, your adversary must experience love. Ridiculous. We hate all sorts of people over the years: The boss, or the ex-, or the co-worker, the liberal, the fundamentalist, the President, that one, this one, the next one, the media, and the (insert the demographic of choice who you believe is ruining everything. I’d keep mentioning groups but the list is tragically long). We are all guilty of this. In our honest moments, many of us might admit to enjoying the fact of having an enemy; someone to cast our anger on, someone to take the blame for our faults or the faults of the world, someone to hate. We have plenty of language for this – the “scapegoating,” or the idea of “projecting.” It can be cathartic and even without the fancy words, our enemies not only serve the role of villain but they fulfill our need to the hero or the protagonist of our story. What would happen if you had to stop hating this person or this set of people? But this scene plays out in my mind as quite extraordinary. I was saddened on all sorts of levels. He and his dad never resolved their issues. And now it was too late. Further, the expressed regret of his father’s death was that he could no longer be hated. I was saddened by what his father did to him and what the man did back to his father. My friend felt even worse when he lost his most hated person in life. Now I know it’s more complicated than that but I was even more saddened that this was not an isolated moment but a cycle and a pattern played out in all sorts of ways for all sorts of reasons by all of us. Is there hate hidden and afixed in each of our souls? Can we fulfill Jesus’ words of loving the enemy? In the context of the Gospel of Matthew, Jesus was probably referencing the occupying Romans, but it carried on to anyone that has oppressed us or hurt us or our loved ones. And Jesus calls us to love them. Is it really peace if my enemy does not experience my peace? Which brings up these other questions. Does this mean we extend peace to our enemies and what does that actually look like? Are we really just supposed to forget about what makes them our enemy and just get over it? The first step seems to confront our hatred toward our enemy and seek how to apply Jesus’ words of loving our enemy. This does not mean just let the past be the past or just get over it or even remove our appropriate boundaries from abusers. Loving the enemy and extending peace to them does not remove the need for justice and perhaps appropriate punishment. Jesus is not unjust or dense. I think he and his teachings are even more profound than we can often appreciate. This first step of confronting our hatred ought to force us to do things. First to recognize why we want to call them our enemy and two, pray for the power to see them in a different way. A way that eventually leads to love. Which could be a miracle and Jesus maybe trying to show you and me something just like that. Another post being drafted continuing this ridiculous notion of showing love and peace to our enemies coming soon. Thanks for reading. Peace. Been thinking about it all week. Maybe you have too. It is such a loaded word though. It has many different meanings depending on the situation. Peace for some is the absence of violence. For others, it’s that moment of serenity and silence. In the yoga class that I drop-in, I think it means to lay still, forget about your to-do list, and meditate on your intention. And focus on your breathing, it’s always about your breathing. In those ways, peace feels wonderful, but it also feels a bit like a luxury. Is peace just for the privileged, or for those that can secure the borders of their lives, for those strong in their mental health and their downward dog? And for those mindful of their breathing (always the breathing). As a pastor and here, as a blogger, I encourage you to consider that maybe peace is bigger than non-violence, silence, serenity and stillness. What if peace was more than that, and not just for the elite, or for those that can procure it? What if it was for everyone? What if peace was more about what it means to live in a just, a rightly-ordered world that was charged with love, beauty, and creativity? So if God’s justice is a picture of how all things are supposed to be, perhaps God’s peace is the confidence and joy we receive from that Shalom. What if peace was basking in God’s goodness? When Jesus is called the Prince of Peace, I think it means much more than we typically give it credit for. To change the synonyms around (but to keep the alliteration for fun), being the Prince of Peace is more than being the Sultan of Stillness, or the Caesar of Silence, or the Torchbearer of Treaties. The Prince of Peace promises to bring even more. What inspires me about peace is the idea of the confidence one can have for the vision of God’s Shalom. This is the picture of how all things are supposed to be. I’m tempted to say something like, “peace is the secret sauce” of what makes heaven actually be “heaven” but I pushed it a little bit with the alteration. And two, that’s simply not correct. Heaven is “heaven” because being of God’s full presence. Peace is more like the oxygen we get to breath in the presence of God. Every paradise we imagine eventually breaks down because your paradise always rotates around you. And your pardise would likely disappoint me. I bet it would disappoint you after a while too. Please take no offense because I also know my paradise would disappoint you as well. It’s not intentional, it’s what’s missing when heaven doesn’t revolve around God and revolves around self. Here our visions of heaven fall short and so does our understanding our peace. It’s why I like to encourage people to consider that peace is bigger than non-violence. Don’t get me wrong, I would be thrilled with a world that chose not to harm one another, that would be a vast improvement. If you give me the choice between this one and that one, I’d ask for the fine print and do my due diligence, but pretty sure I’m going to choose the non-violent world. But if God is promising me something even better, then why move twice? And to intentionally mix the metaphor to make my real point – Why not pursue the better vision of peace over the lesser, incomplete one? What I think our souls crave is not just to live in a space without harm but to live in one that loved each other (For those interest, I unpack that a bit more in earlier posts). Peace is not the same as non-violence. That’s a great result. Nor is it the same as silence and stillness – those are among the vehicles we ought to use to pursue peace. Peace is more and I’ll do my best to unpack that in future posts. Til the next time, what if when you meditate on peace, you imagine that it’s even more than what the world has said about it? But don’t forget about the breathing, the breathing.